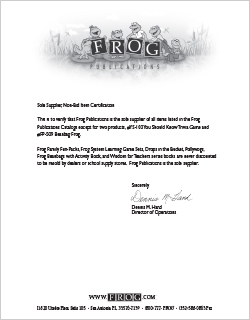 Frog Publications is the sole supplier of all items listed in the Frog Publications Catalogs #FP-509 Beanbag Frogs. Frog Beanbags with Activity Book, and Wisdom for Teachers series books are never discounted to be resold by dealers or school supply stores. Frog Publications is the sole supplier. Click here to download our Sole Source Letter.